On this day in 1915, the Wyoming State Bar was organized making 2015 their centennial. This was actually not the first such organization in Wyoming. The Wyoming Bar Association was organized on January 24, 1889 in Cheyenne but the group disbanded around 1899. Many of these same men were influential in organizing the State Bar 26 years later. 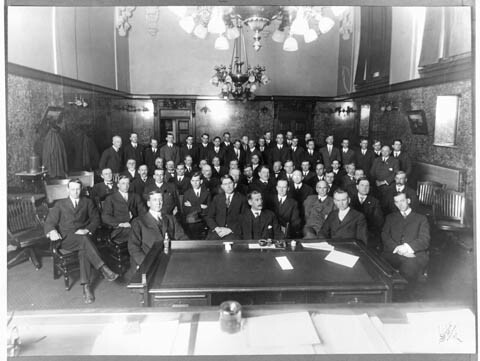 Members of the First Wyoming State Bar Association in the Federal Courtroom in Cheyenne on January 25, 1915. The bar is such an important factor in molding public opinion that its influence is felt in almost every department of life and it is because of the very marked influence of the bar in shaping not only the destines of men, but governments as well, that I would urge a fuller appreciation of the essential dignity, worth, nobility and usefulness of our calling. The lawyer (and I wish you to note that I place special emphasis on the word lawyer, which does not include a pettifogger or shyster, terms applied to those who, instead of adorning the profession, disgrace it). The lawyer, I repeat, is one who worthily magnifies the nature and duties of his office, one who scorns any form of meanness or disreputable practice… The lawyer’s work offers many temptations and often calls for nice discrimination between good and bad. It is of the utmost importance therefore that the members of the bar set their standards high, for in good hands the profession is a bulwark of society; in bad hands it is a menace. Today is the birthday of a Civil War general, lawyer and governor of both Wyoming Territory and the State of Nebraska. 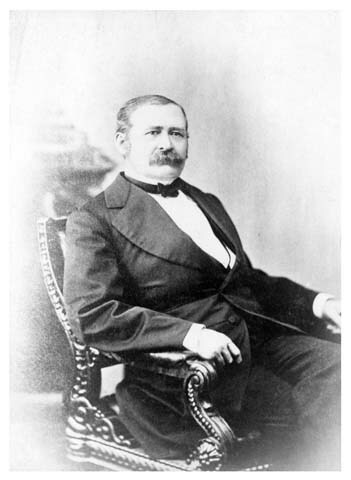 The second Wyoming territorial governor was born at Bellingham, Massachusetts on January 24, 1820. John Milton Thayer’s early life consisted of farming, with school attendance filling the winter months. He was admitted to Brown University in Providence, Rhode Island when he was 17. After graduating in 1841, Thayer worked in a Worcester, Massachusetts law office. He also began what would be an intermittent but accomplished military career when he joined a “light infantry” company of the Massachusetts Militia. He married Mary Torrey Allen in 1842. Thayer also holds the distinction of being the earliest born governor of Wyoming, though not the oldest to take office. When the Kansas-Nebraska Act opened up new territories for settlement in 1854, Thayer traveled to Nebraska in the summer of that year to view the country. He liked what he saw and brought Ms. Thayer to the new territory in the fall. They eventually settled in Omaha. In January 1855, Thayer was appointed Brigadier General of the 1st Brigade of the Nebraska Militia. The appointment was supported by legislative commission the following month. One year later he was commissioned Major General. He served six years and was embroiled to varying degrees in struggles with regional Indian tribes. As governor, Thayer’s military background ensured that he would do his best to arm the territory’s militia to the best of his ability. After failed attempts at gaining seats in the territorial legislature and Congress, Thayer was elected to the Nebraska Territorial Council in 1860. 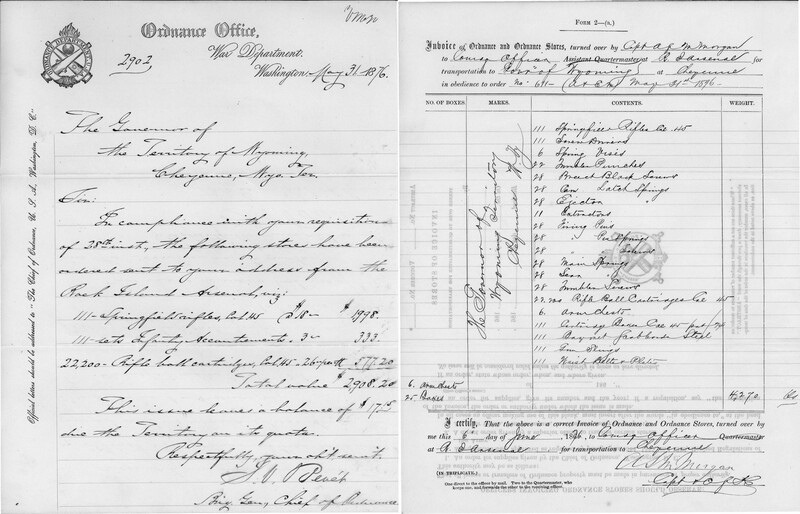 When the Civil War began, Thayer contacted the Secretary of War, asking that a regiment be assigned to Nebraska. Subsequently, the First Nebraska Regiment was organized, commanded by Colonel John Thayer. The regiment served in the western theater, including two years under General Ulysses Grant. Thayer is reported to have distinguished himself during several engagements, including Fort Donelson and Shiloh. His war record served him well as he returned to the Nebraska political arena. He was elected by the territorial legislature to fill one of two U.S. Senate seats, and began in that service in March 1867. Thayer was noted for his input regarding Indian issues, and for his work in getting confirmation of Omaha land titles and acquiring a federal land district for Nebraska. Thayer was defeated in senatorial elections in 1871 and 1875. However, President Grant kept his former comrade in arms in public service by appointing him Governor of Wyoming Territory. The Cheyenne Daily Leader welcomed the appointment, stating “The new Governor is well known to the people of Wyoming, for he has for many years been identified with the interests of the far west, and especially of this territory.” The editor felt Thayer’s “experience as a legislator, his extensive acquaintance with the leading men of the nation and his personal popularity with the authorities at Washington” would benefit the young Territory. As governor, it was Thayer’s job to see that the newly created seats in the Territorial Assembly were equally apportioned. A copy of his proclamation was printed in this 1874 newspaper clipping. In his 1875 message to the Wyoming Territorial Assembly, Thayer, Republican that he was, spoke on the need to reduce taxation and the expenses of county governments. He also supported the preservation of game animals, stocking streams with fish, and limiting taxes on new industries. Possibly referring to the railroad strikes of 1877, Thayer’s message that year stressed the need for corporate entities and their employees “to appreciate that the interests of each are the interests of the other.” He also supported the annexation of the western portion of Dakota Territory to Wyoming Territory, citing similar interests of the residents, a suggestion that never bore fruit. During Thayer’s term, Crook County was created by the Territorial Assembly. It would not be organized for 10 years. President Hayes relieved Thayer of his gubernatorial duties in May 1878. He returned to Nebraska and made his home in Grand Island. He made one last attempt at Congress in 1883 without success. However his last foray into politics was successful as he was elected to two consecutive terms as Nebraska’s Governor, 1887-1891. A contested election delayed Thayer’s retirement from office. When that issue was settled he traveled to the Eastern U.S. with his ill wife. She died there in the fall of 1892. Thayer returned to Nebraska, residing in Lincoln, where he died March 19, 1906, at the age of 86. Just a reminder that the Archives will be closed on Monday, January 19 to observe Martin Luther King, Jr. Day/ Wyoming Equality Day. 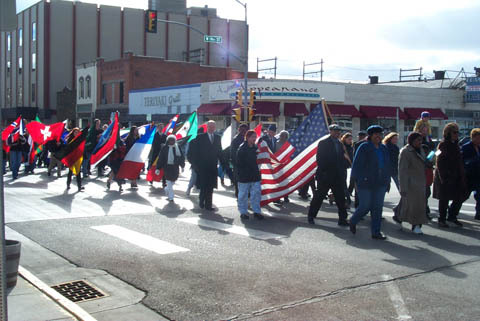 Governor Geringer participates in the 2001 Martin Luther King, Jr./Wyoming Equality Day march up Capitol Avenue. He is in the center wearing long wool coat, walking just behind the US flag.